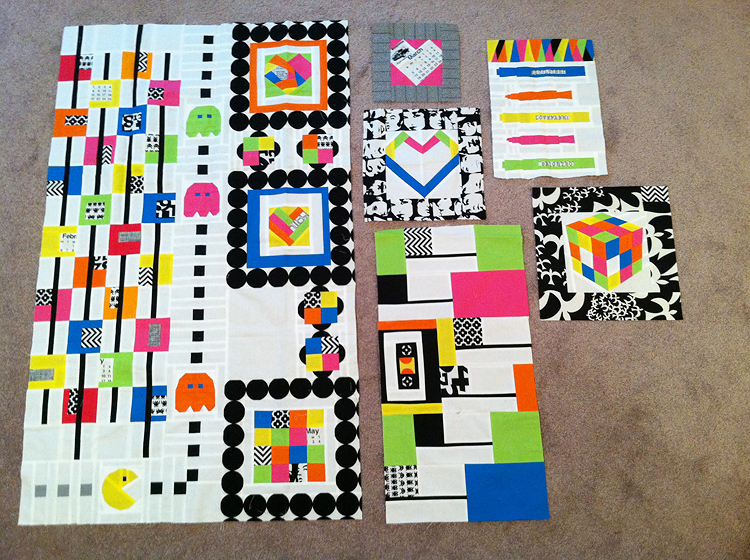 Elizabeth's quilt is 80's themed. She found some really, really bright fabrics to send along with the quilt. I'm talking neon! This is how the quilt looked when I received it. So many people had already added amazing things to the quilt. Check out the Pac Man by Monica! Genius. I was going back and forth on a few ideas. MTV logo, Cindy Lauper silhouette. In the end, I'm not that good of a sewist for those. :) But I knew I could do a Rubik cube! I did a little searching on Google Images and found a nice Rubik graphic. I opened it up in Photoshop and traced the lines to come up with a bit of a paper piecing template. I printed the image out and cut it into sections based on each side of the Rubik Cube. Then I cut those sides into strips and paper pieced each strip. 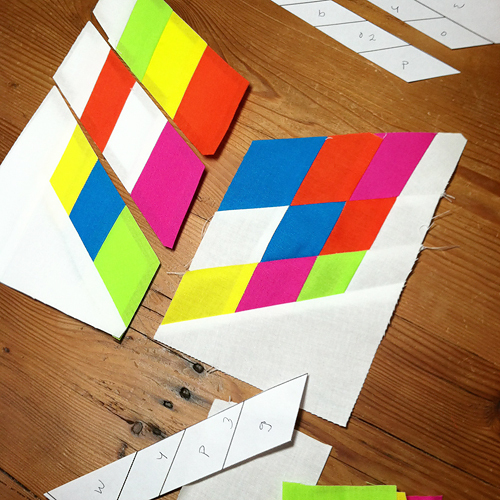 Once I had the strips sewn together to form each side, I pieced them together as I would any Y-Seam. That was a little trickier than anything I've done, as I not only had to line up the y-seam, but also the seams of the color squares on the Rubik Cube. 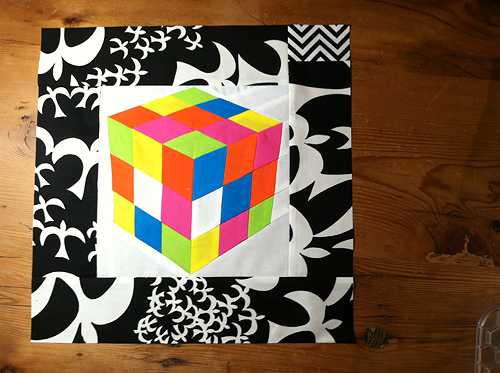 Elizabeth's quilt also uses some black and white prints. I dug around in my stash and found this older Seagull print (Alexander Henry I think?). 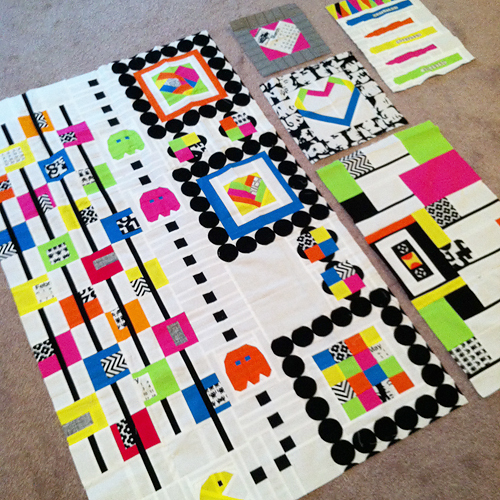 Since this is an 80's themed quilt, I thought it was a bit clever and reminded me of the band Flock of Seagulls. Hopefully you don't hate the band Elizabeth! 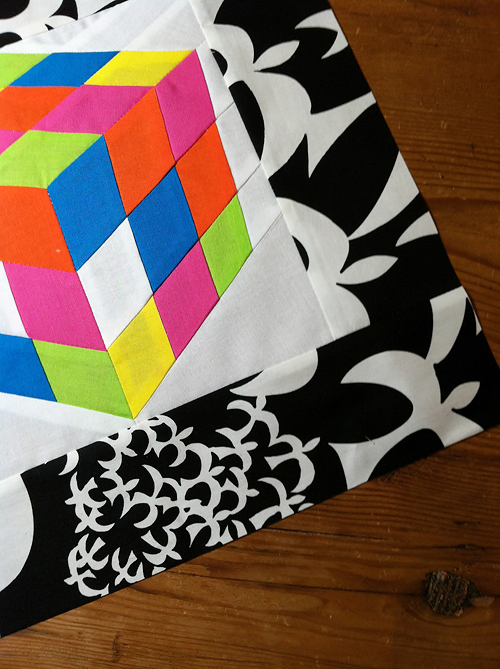 I've mailed the quilt on to Ashley and am excited to see what she adds!